Thrilled to announce that I’m co-hosting a new weekly podcast called This Week in Google (TWiG) with lovable tech guy Leo Laporte and journalist extraordinaire Jeff Jarvis. We’ll cover cloud computing in general as well as Google-related news, products, and tips. We recorded our first episode this past Saturday afternoon, and it’s now available for download or subscription in your podcatcher of choice. You can watch the unedited video here. If you’re at your computer on Saturdays at 2:15PM Pacific/5:15PM Eastern, watch us record episodes live with Skype video and IRC chat at TWiT Live. You can also comment on stories we’ll cover each episode in the TWiG FriendFeed room. In our pilot episode one, “In Beta,” we yakked about Google Voice and the iTunes App Store, Gmail Labs, Google Wave, the real-time web, and the future of journalism. Jeff and Leo are such knowledgeable and experienced co-hosts. I’m darn lucky to get to shoot the breeze and pick their brains about this stuff. I hope you’ll join us. Get links to the MP3 and all the related stories for each episode here. 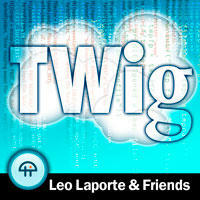 TWiG is also available in the iTunes Store. This is great Gina. Congratulations! I look forward to floating in the clouds with you guys. Congrats on the new podcast. I really like the name of the podcast. TWiG is the name that I used in a series of articles for This Week in Geocaching – http://bit.ly/16n27c. Best of luck on the new podcast. I’m looking forward for more. really really great podcast. best part is that even on the first episode, it sounds more professional than casts i’ve been listening to for years! good times. Loved the podcast. I might start liking this more than some of the others that I have listened to for years. One question, you and Leo were raving about some online presentation tool “Prezzy” (?). Where is said tool? I’ve Googled that word in every different way I can think of. I also looked in the notes and saw nothing. Help! Now will we be able to watch you via Skype? Or just from the website?